We are proud and happy to welcome you home. Thank you for serving our country and protecting the freedoms we all enjoy. We honor your commitment and sacrifices in serving our country. God bless you and all our soldiers. Thanks for everything you are doing for my son and all soldiers coming home it really makes a big difference and great impact in their lives that their country cares about them because of people like you. thanks and god bless you all. I am proud of you. God blessed me with a son whom is not only a soldier of the United States Army but that you are also a soldier of God and we know you have a special calling and no father can ask for no better son then the one I have which is you. You are my hero my angel my buddy my blackhawk fan, but the most important thing is that you are my son. 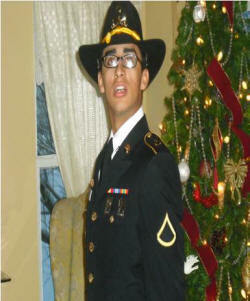 So I salute you my son and I tip my hat of respect and love to my Jonathan " AN AMERICAN HERO "